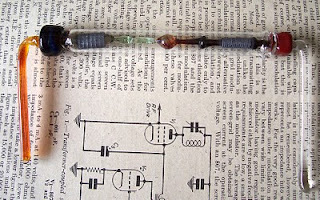 SteamPunk Glass: SteamPunk Valves - Can you tell what it is yet? SteamPunk Valves - Can you tell what it is yet? Having a bit more time to breathe has let me think more about the ‘art’ side of what I do. This still feels a very alien concept to me, when I first went to technical college we shared campus with an art college which took up an opposing side of the campus to us. It always felt like an opposition too, few of the engineering students would even visit the union bar as it was very much in the art department’s domain. One of our tutors (who could make Gordon Ramsey blush, I learnt both engineering physics and new swear words from him) claimed to be banned from the staff room permanently due to his run-ins with art tutors! Welded metal sculptures were very popular with them, with many dotted around campus. He claimed that they installed a very large one outside the main technical college entrance on a large patch of lawn, which would have been highly visible from the science blocks windows. He said he then phoned the local council to complain that someone had dumped a load of scrap metal on the campus lawn, and demanded they come and clear it away – which they did! We couldn’t get anyone else to confirm – or even deny – that this had occurred, but I suppose it goes someway to showing my in built reservations about this ‘art’ stuff! Lately I am much more drawn to it, I still try and make it functional art, such as pendants and jewellery and so on. A few more sculptural pieces seem to be ‘arriving’ in my workshop though, but I am still trying to break down my inner reluctance to really go for it. I even managed some rather good flower parts, but ended up putting to one side deciding it was too much of a waste of good glass to make the full thing. 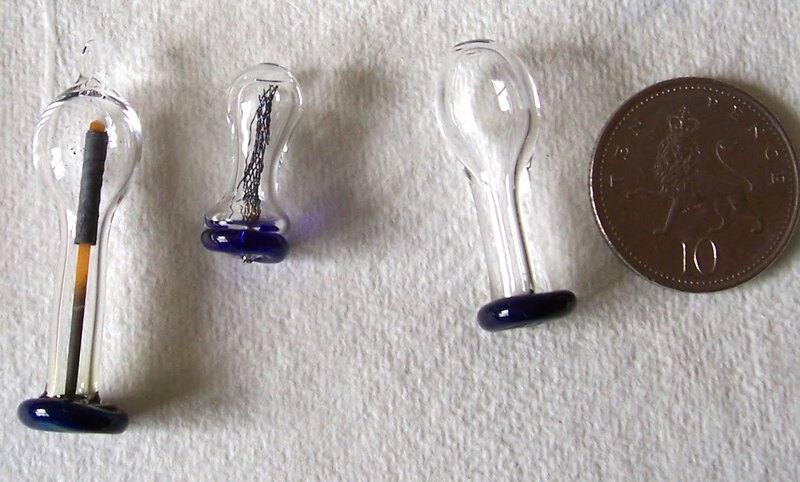 However this rather natty and totally barmy bit of glass ‘happened’ the other week as I revisited some lampwork valve ideas. I managed to break the first tube after I first got everything together, but it was so interesting I took the trouble to refit it all in a new tube. Some of the metal bits have suffered, but are still intact despite they grey colour, which I actually kinda of like. 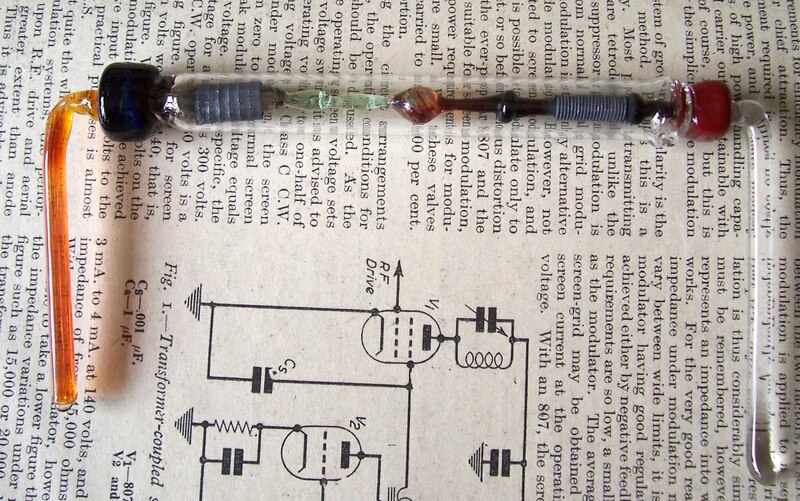 Apart from the copper coil and grey metal bar at the opposite end this is all glass. There is a tiny blowout hole on the right underneath by the red seal to help equalise the pressure of the hot gas to stop later cracks. It's about 5 inches long. 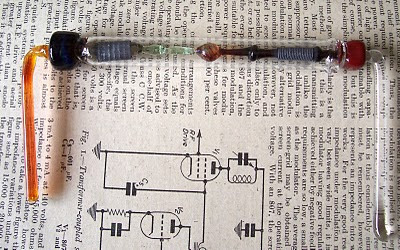 I am going to use that to insert some copper wires/device as part of it, and the longer glass rods will drop down inside a box. I’ve got quite a few bits to go with this, but it appeals to me to make something Steampunk that isn’t just something with cogs stuck on it! (I’ll save that rant for another time!) It appeals also to that sense of wonder I got as a kid opening these old radiograms with their strange colourful oversized components and glowing glass wonders! I’ll post more about this as it goes along. lol at your college story. I went to what was then UMIST - University of Manchester Institute of Science & Technology - but shared halls with Manchester Uni students as well. The er, competitiveness, was just the same. It's very unfair when you have 30+hrs of labs & lectures a week and the arts/lit/lang students across the hall have two lectures and play French Acid Jazz at 4am every night...! It's definitely hard to get your head around "art for art's sake" when you've spent most of your years in education being practical. Love the valves - reminds me of things my grandad used to design (he was a draughtsman & engineer for Pilkington Glass).